The kit models a dry-ice car owned by the Liquid Carbonic Corporation of Chicago. These were heavily insulated for their very cold cargo, and most cars for this service had distinctive details. The Varney car was intended to represent one of 11 cars in a 1934-built car series, numbered 1000–1010. 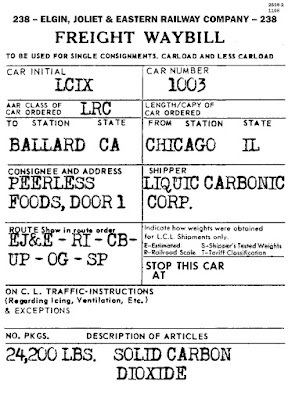 The cars were originally classified in AAR Class RC, for carbon-dioxide refrigerators, but this type of car was later moved into AAR Class L, for special car types, specifically Class LRC, for carbon-dioxide cars. And by the way, all 11 cars of this series were still in service in 1953, the year I model. Here is an AC&F builder photo. You can see the silver color of the car, including the roof, and the slight taper of the upper half of the car sides (also visible, of course, on the ends). The volume of insulation is indicated by the fact that although the car was 44 feet long inside, it only had a cubic capacity of 703 cubic feet. Calling it a “refrigerator” is a bit of a misnomer, of course, since it only carried the refrigerant as a cargo, but it is certainly within the general characteristics of insulated house cars, like reefers and insulated box cars. I have seen a number of these Varney models at swap meets over the years, often badly assembled or dented from rough handling, and not attractive to try and rescue. The car sides and ends are foil-covered cardstock, and do dent easily. But eventually I found one in good shape, and decided to give it a go. The overly heavy grab irons and the sill steps made from staples were removed, along with the dummy couplers on the car. Here is the state of the car at that point. The car is missing the side ladder below the door, and the foil on one end has separated from the underlying cardstock (easily re-glued). You may note that Varney did not deign to reproduce the side taper, an omission I can live with. The lettering scheme is a later one than the scheme in the builder photo shown above. I needed to clean up and repair the roof, and of course add a running board. I also added wire grab irons and Tuttle sill steps, and a ladder under the side door, with an accompanying sill step under that ladder. The as-built kit is close to weightless, so I glued some sheet lead to the floor on either side of the center sill. I also added end lettering, as well as reweigh and repack paint patches (the black rectangles below) and lettering from Sunshine data sets. I researched the operations of Liquid Carbonic to find out where they had plants around the country to manufacture dry ice. Their real focus was originally on “carbonic acid,” which is carbon dioxide in water, supplied under pressure to get more CO2 into solution, and used to make carbonated water for soda fountains (for a nice summary of their role here, see this: https://www.drugstoremuseum.com/soda-fountain/liquid-carbonic-co/ ). In fact, Liquid Carbonic manufactured complete soda fountains for years. 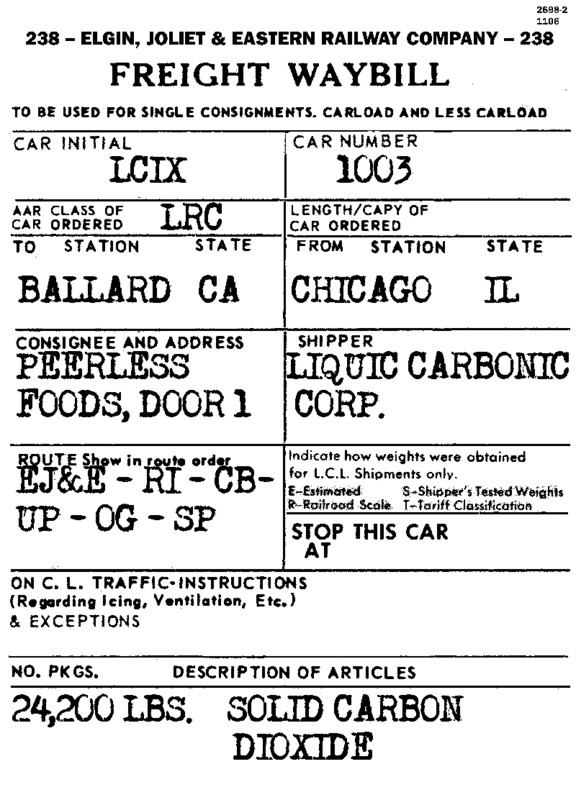 When they started producing dry ice, they took advantage of their name recognition, and called it “carbonic ice,” as is lettered on this car. Later they got into the supply of many industrial gasses. Their main plant was in Chicago, so I decided to have my on-line shipments arrive from there. Here is one of the waybills I use. This was a fun project for me, bringing an ancient Varney cardstock freight car up to a level that I could use it on my layout. There are only a few cars this classical in my freight car fleet, but I am glad to have them and, what’s more, to operate them.